A blog about mechanics, tools, and procedures used in miniature wargaming, and how they influence or drive game design. Each blog entry requires quite some research and analysis, and the aim is to get one piece out every month. I occasionally alter or add to a specific blog entry, when I encounter some additional info elsewhere, or when there occurs some follow-up discussions on this blog or other forums. All battles in wargames are usually played in "neutral weather". It never rains, the field is never muddy, there is no fog, and it's not too hot. However, there are plenty historical examples showing that weather did play an important role on the battlefield. Waterloo is a notorious example. 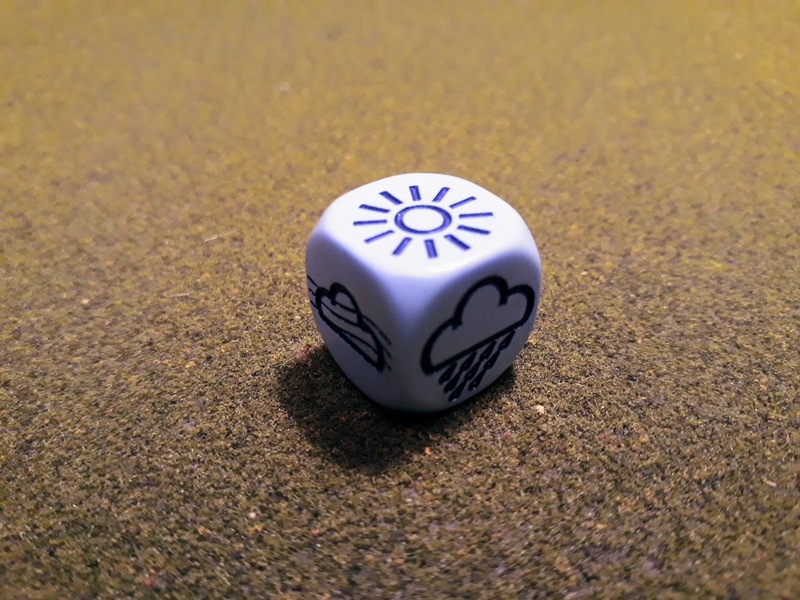 For miniature wargames, how weather can be represented visually. But perhaps this is pushing things a bit too far? Although waether is often ignored in games, it has always been a part of wargaming. 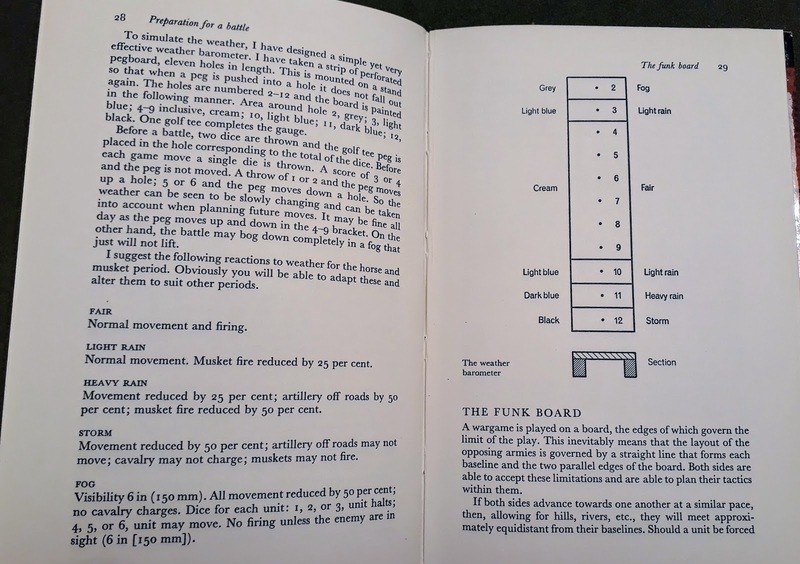 The classic board wargame Tactics II (1958) has a weather table, along with effects on movement and combat. 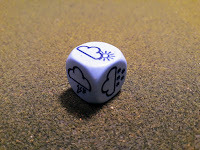 The idea is that every turn one rolls a D6 for the weather. Since one turn is supposed to represent one month, it is seasonal weather rather than day-to-day weather, and a different table is used for each season. 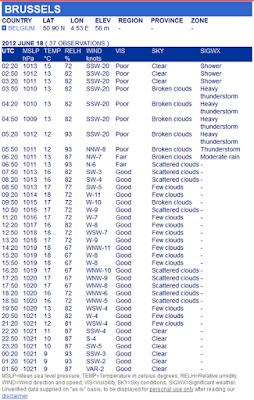 The chart below is the actual weather table from Tactics II, along with its effects on movement and combat. Very much the same approach can be found in many miniature wargaming rulesets, in which the weather is rolled for - perhaps depending on season and location - and the resulting weather has an effect on movement, combat etc. However, suppose we want to include changing weather during the wargaming day? Surely we want a continuous change, i.e. we do not want to have a bright and sunny day on turn 1, a snowstorm on day 2, to turn to cloudy and foggy the turn after. 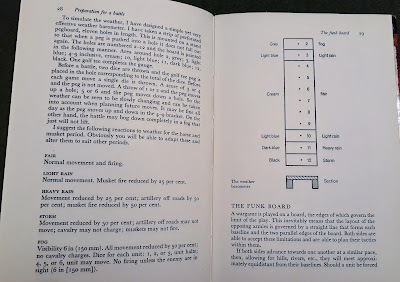 In the classic book "Practical Wargaming" (1974), Charlie Wesencraft proposed an interesting mechanic to ensure we have this continuous change. The idea is to represent all weather conditions on a linear scale, and roll each turn for a step "up" or "down" on this weather gauge. The actual device could be simply a marker that is put on the weather gauge, or a little pin that is put in drilled holes, etc. The relevant 2 pages from the book are shown below, but the ideas was published a few years earlier in Wargamer's Newsletter, April 1971. 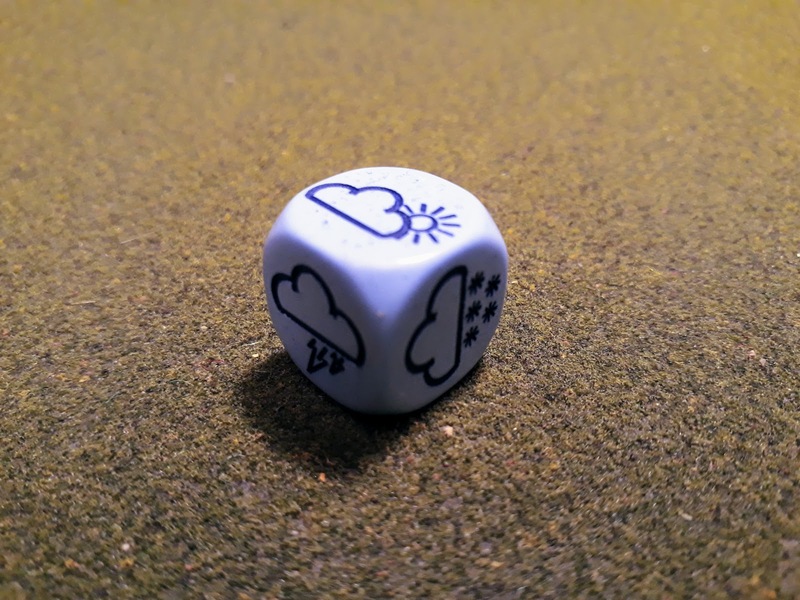 A particular useful variation might be to allow players to move the weather gauge up or down one step (instead of it being a random outcome), depending on some exceptional die roll during the game (e.g. rolling a 12 on a 2D6 during a command roll), much in the same way as we would allow a player to control the length of the game (see our blogpost about The Last Turn in the Game). Thus, a player might want to move the weather to conditions that favour him more on the battlefield for a given scenario or tactical situation. Apart from a gradual shift each turn, one still has to determine the "starting weather" for the game. A useful tool for this is a "weather die", which has various weather symbols. Since the various outcomes can vary wildly (sun to snow), perhaps a second D6 can be used to indicate variations within the main weather rolled for. If you don't like rolling for weather at all, but still want to include weather and weather effects during the game, a very useful alternative is to look at historical weather records. These days, many weather records can be consulted online - actual websites may vary from country to country. Now, suppose we want the weather record for the 18th of June, 1815, near Waterloo. 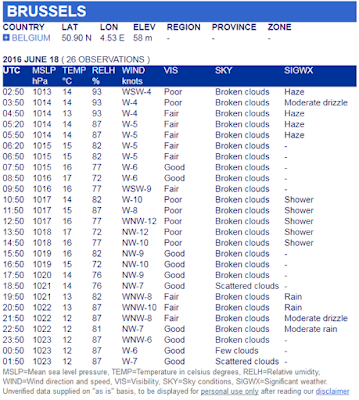 Of course, this pre-dates the actual archived and recorded weather measurements, but we could take the 18th of June in a year for which measurements are available, thus using a plausible weather pattern for our wargame. 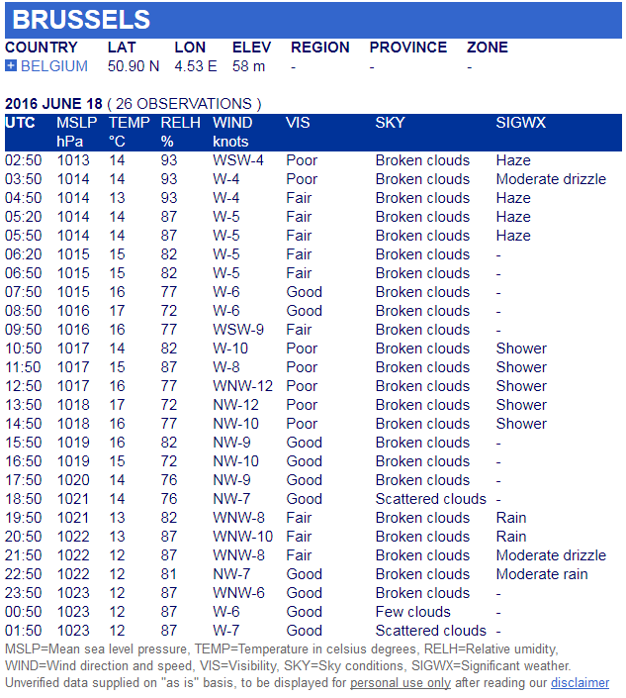 Let's say we would like to have the weather at Waterloo, on the 18th of June. We use Brussels as a close enough location, so let's try to find the weather for June 18 in different years. (I used http://www.eurometeo.com/english/ for generating these reports, but there are a number of similar sites available). 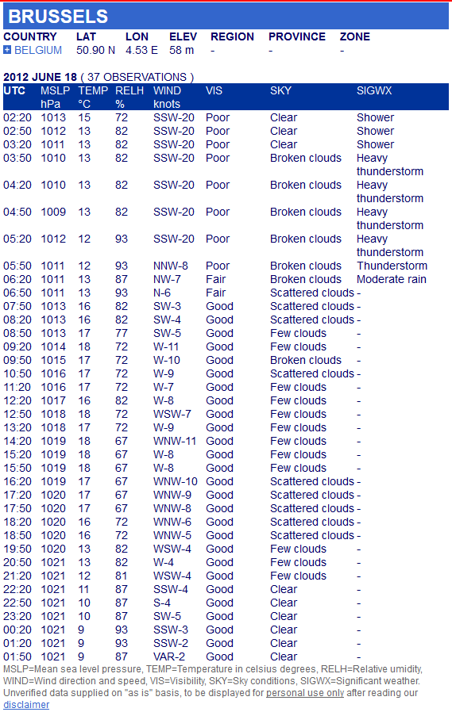 These seem like interesting weather records, and you can imagine using the sky conditions or the "significant weather" column as the weather pattern for the wargaming day. Food for thought! Thanks for an interesting post. One of the Internet's lost treasures was a website that had the weather conditions for every day of the Second World War in Europe. I believe it was taken down prior to any internet archive projects. It was a wonderful tool for scenario creation. In Avalon Hill's Magazine "The General" a weather system was proposed for the Board Game's PanzerBlitz and Panzer Leader. Blitz depicted the war in the East and Leader the War in the West. The system was a series of charts the dealt with precipitation and ground conditions. Snow or Rain, mud or Frozen 3 different level of each. Scenarios cards in those games had a historical date on them. The charts had varied chances of weather based on season. I am probably making them sound more complex then they were. Anyway, they greatly improved game play at little complexity cost, by making a few die rolls prior to start of game. Conversely, players could agree to relevant conditions instead of randomly choosing them. For example for the Battle of Bulge scenarios heavy snow on the ground was often chosen. This made slight changes to the terrain. Open ground cost extra Movement points due to snow or mud. Streams would cost less if frozen etc. A few simple changes to terrain movement effects really made a difference. Lots of fun. Such a website - carting weather conditions for every day during a specific campaign - sounds indeed as a great resource. Professor, Computer Science, KU Leuven, Geek4life, Computer Graphics, Digital Revolution, Higher education policies, Politics, History, Wargaming.